There is no precedent for South Sydney's salary cap dispensation - a $1.5 million gift the NRL must explain. Rival clubs are struggling to make sense of it. Frustration leads, before anger. Manly applied for salary cap dispensation for Steve Matai and Brett Stewart in 2017. Motion denied: Matai failed to play a game in 2017 but his $600,000 salary was carried on the cap. Stewart also failed to have his injuries qualify for a medical retirement so his salary for 2017, even though he missed the final third of the 2016 season and all of 2017, was also carried on the cap. Nathan Ross retired earlier this year and the Knights got no cap dispensation. Ross was so busted he retired immediately. The Knights now play with a Ross-sized hole in the cap. Wests Tigers offered Robbie Farah an ambassador's job for when he retired some years back. Farah never indicated he would take up, he was sacked before he got the chance, and because the offer was not disclosed it was enough for the NRL to suspend chief executive Justin Pascoe six months and strip the Tigers $639,000 from this season's cap. Yet Inglis retires, makes the generous offer to let his co-owners James Packer (who last week tried to sell his casino empire for $10 billion) and Russell Crowe (who at his peak commanded $20 million a movie) off paying him the $1.5 million remaining on his contract, and instead takes up a job working for Souths' charity arm. And the NRL says sweet. Even though the NRL was forced to admit that it has yet to examine details of the financial package Souths proposed. "Really?" said one chief executive. "They're just burying themselves deeper and deeper. This will be the end of them. "What's the deal entail? How much are they paying him?" It is important here to play the ball and not the man. Nobody wants to deny Inglis a future in the game. "The game needs him," Bulldogs chief executive Andrew Hill said. "Nobody wants to see him out of the game. Greg has done enormous things for the game, for the rugby league community and for the indigenous community. "But when things like this happen you've got to take everything into account and the challenge for all of us is the lack of transparency here to understand what the deal is. "It's important for the game to have transparency so we can all understand what it is." Inglis is a legend of the game. It is a statement not made lightly. His legend will grow and his status will remain unquestioned. Take in all the great players of the last generation - Cameron Smith, Johnathan Thurston, Billy Slater, Darren Lockyer, even Andrew Johns - and none of them has a highlights reel that compares with Inglis. Everybody wants the best for him. But the integrity of the salary cap, and a public trust in it, is crucial. Otherwise we might as well pack up the caravans. The easy transition into retirement and a job at the club all appears too convenient for other club bosses. "You begin your transition for players years before they retire," one club boss said. "If Greg planned on retiring in two years' time then what usually happens is you budget all your household expenses around your base wage. "So how is he going to make those payments now if he was budgeting to be on a million dollars a year?" Near the end of Inglis's retirement announcement on Monday Souths general manager of football Shane Richardson, who did a superb job of focusing forward, declared: "It's not a job for the boys, it's a real job." 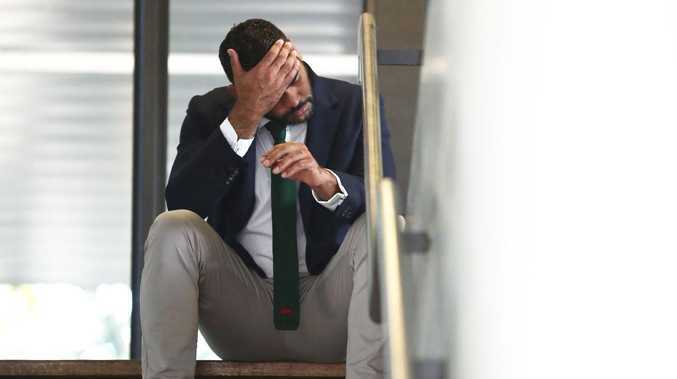 Inglis is waiting for the NRL to clear a job as a development coach, an indigenous mentor and also a role within the club's charity arm, Souths Cares. Richarson also indicated the NRL is considering supplementing his wage with an ambassadorial role. This comes at a time when the NRL is cutting back on its staff particularly ambassadors. Inglis has no formal education or no experience in welfare. 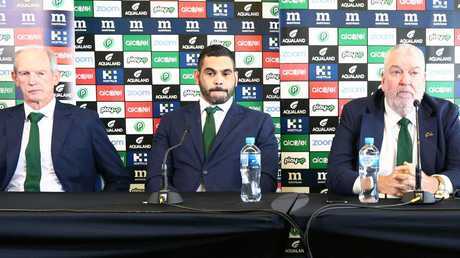 NRL boss Todd Greenberg came under criticism last year for writing Inglis a character reference when Inglis attended court on a drink-driving charge. 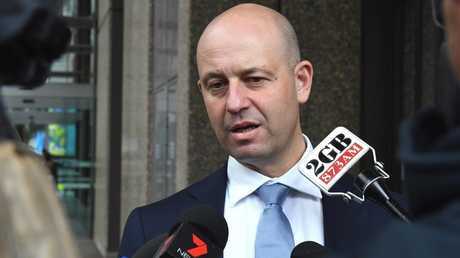 Greenberg later defended the reference against allegations he had overstepped the mark by pointing out his friendship with Inglis. "Greg Inglis has been known to me for a long, long time. I would say I have a close relationship with him," he told Fox League's League Life last month. Salary cap are complicated and dry. Retirements are emotional. It is important not to confuse one with the other.